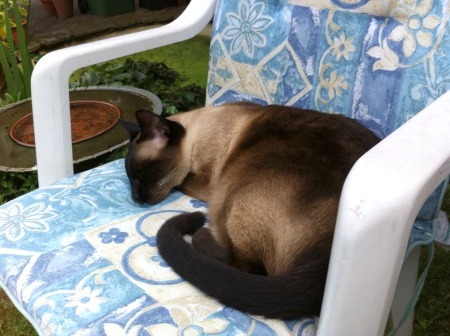 Welcome to August's Meezer Musings and the height of summer (for some of us, at least - several of our readers have told me that it's been very hot where they live). You may have noticed that there wasn't a July newsletter - it was a particularly busy time and I didn't get round to writing Meezer Musings, but we're back again! Here in the UK we haven't had much of a summer so far although we've had one or two 'mini-heatwaves' - when the sun has come out, it's been very intense. Bandit always enjoys the summer and loves curling up on the cushioned garden chairs - preferably in a warm but shady spot, out of the direct sunlight. I received an email from one of our readers, Clifford, telling me about a Siamese cat I'd missed out, over on our 'We Are Siamese' page about Siamese cats in books and films. I first saw The Wizard of Oz at a drive-in movie theater when I was about five years old. I have no idea why we were at a drive-in. We lived in East Africa then, and drive-ins were particularly popular around that time so there must have been one near us. The screen was enormous, and my abiding memory of that film was of the Wicked Witch and her flying monkeys in glorious technicolor and HUGE - they were absolutely terrifying to my five-year-old self. But despite this scary first encounter, The Wizard of Oz was and still is one of my favorite movies of all time. I'd never noticed that there was a Siamese cat in it, though. 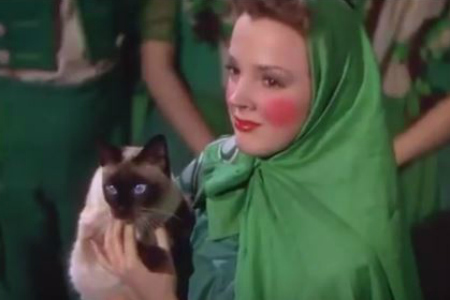 Towards the end of the film, just as Dorothy and Toto are about to leave for Kansas with the wizard in the hot air balloon, Toto spots a cat. The rest, as they say, is movie history as Glinda the Good Witch has to help Dorothy to get back home again. "Then close your eyes and tap your heels together three times. And think to yourself, 'there's no place like home'." None of which would have happened without the Siamese cat. Big thanks to Clifford for writing to tell me about it - and here's a clip of that particular scene. Keep your eyes open! From Oz back to the summer sun. All cats enjoy lying in warm sun puddles but it's important they don't overheat so if you're experiencing sweltering temperatures at the moment, here are some topical tips on keeping your cats cool in the hot weather. Supply fresh cold water. In hot weather water evaporates very quickly. Check bowls twice daily - clean them out and fill them up! Some cats like ice cubes added to their water, some don't. If you'd like to experiment, provide a choice of iced and non-iced water. To encourage cats to drink plenty, you might like to try a drinking fountain (see below). Feed wet food. Some cats just don't drink enough water, which is a problem in hot weather. If you usually feed dry food, consider switching to wet, and add water. Bandit loves licking the gravy off his food, and I've found that adding water to make extra gravy is a sneaky way of getting more fluid into him. Water is, of course, essential to a cat's health in preventing dehydration and keeping their kidneys functioning well. One way of getting your cats to drink more (not just in hot weather) is to invest in a drinking fountain. As evidenced by the many cats who enjoy drinking from sink and washbasin taps, cats seem to like running water. Drinking fountains, which circulate and oxygenate the water, help to disperse the smell of any chemicals like chlorine, in the water and many come with charcoal filters to remove any impurities from the water. Drinking fountains are available in plastic, ceramic or stainless steel. All three kinds work well but plastic (the least expensive material) tends to get scratched. These small scratches are magnets for bacteria which in some cats can lead to an unpleasant condition called chin acne (small blackhead spots under the chin, which can become infected if you're not careful). This is less likely to happen with ceramic or stainless drinking fountains and these have an added advantage over plastic of being heavier and more stable. Some drinking fountains are priced in the $100-$200 range, which seems rather excessive to me, but here are three mid-range ones by different makers and in different styles. 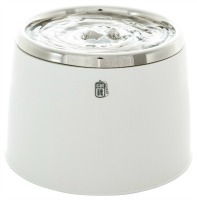 The PetSafe Drinkwell Ceramic Pagoda Fountain has a 70 oz capacity, two drinking areas and two fountain streams. Drinkwell is a well-known name in pet drinking fountains, and this a popular choice. 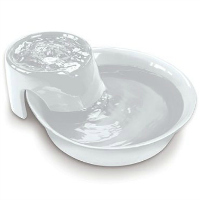 Pioneer Ceramic Big Max Pet Fountain is, as its name suggests, a ceramic fountain with a huge (128 oz capacity) bowl and drinking area, so it's most suitable for dogs and multi-cat households. 64 oz capacity with filter that provides a bubbling surface. 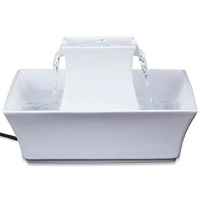 There are many, many different models on the market and as I said, the plastic ones are cheaper, selling somewhere in the $15 to $40 range; however, if you are interested in buying a fountain for your cats, I think it's probably better to invest in one of the ceramic or stainless steel models. Those of you who follow our Facebook page may have seen our 'Throwback Thursday' photos from the 1950s, 60s and 70s (and even further back) of famous personalities with the Siamese cats in their lives. 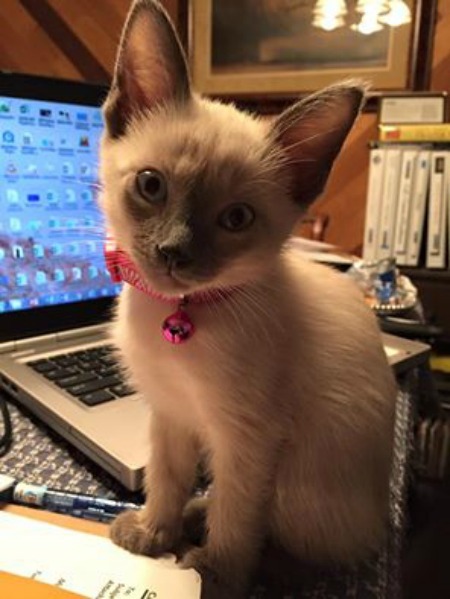 Many of the photos have been found and shared by Donna Castele, who lives with her own Siamese cats Ransom, Jazzmin and new kitten Ziva, who has recently joined the household. As you can see, Ziva's a delightful little bundle of 'kittitude' who's settling in well. 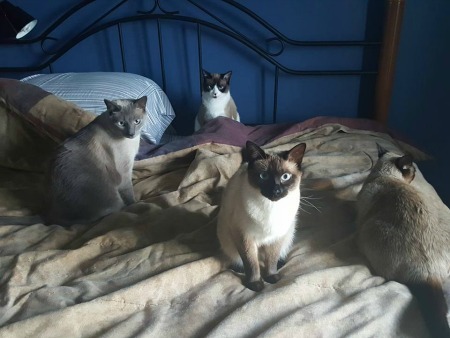 Our Fun from Facebook photo this month comes from William Armstrong, whose four cats, Socs, Lalya, Cappo and Lucky have taken over the bed and seem to be saying "we don't know where you're going to sleep"! In case you're looking for something in particular on this site, we now have a Sitemap of all our pages which may help you to find it so do check there. Butter wouldn't melt - but they're such mischief-makers! It's time for us to say goodbye until September when I hope we'll be back with more 'Siamesery'. Have a good month in the meantime, wherever you are in the world.